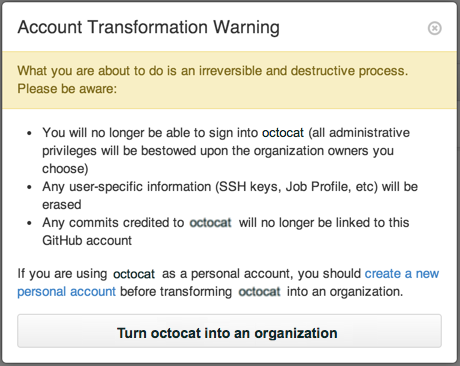 The SSH keys, OAuth tokens, job profile, and associated user information, will not be transferred to the organization. This is only true for the user account that's being converted, not any of the user account's collaborators. If you want your organization to have the same name that you are currently using for your personal account, or if you want to keep your personal user account's information intact, then you must create a new organization and transfer your repositories to it instead of converting your user account into an organization. 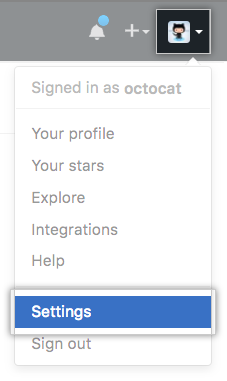 Create a new personal account, which you'll use to sign into GitHub and access the organization and your repositories after you convert. Leave any organizations the user account you're converting has joined. Choose your new organization's pricing plan and enter your billing info if prompted. 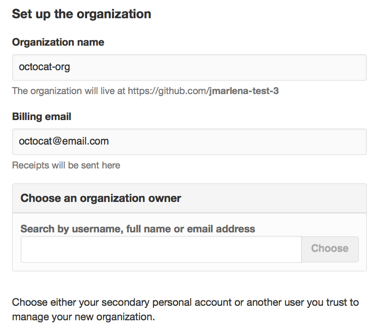 Tip: When you convert a user account into an organization, we'll add collaborators on repositories that belong to the account to the new organization as outside collaborators. You can then invite outside collaborators to become members of your new organization if you wish. For more information, see "Repository permission levels for an organization."